*Fog, falling leaves, the first proper cold – yup, it sure feels like autumn. And I was already resigned to spending the next, oh, eight months in my mostly black cold weather wardrobe – until I ran into Katharina at the Berlin Press Days, wearing such a gloriously colourful outfit that I just had to take her picture. 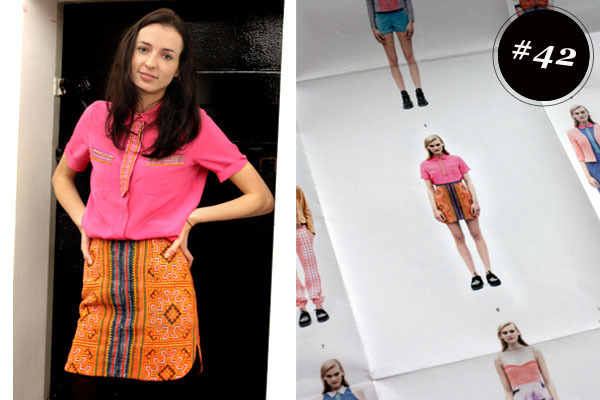 She admitted she rarely wears colour, but couldn’t resist this shirt and skirt from Thu Thu. The label’s designer Thuy Duong Nguyen has her fabrics woven in Vietnam and mixes the patterns and colours into vibrant, modern clothes. You can see more of her beautiful line here. *This is pretty amazing: James’ fashion was featured on Italian Glamour‘s website this week! You can read the article here (or use googletranslate, like we did. Even with that, we’re still not quite sure what the article says. But we think it’s good!) Obviously, I will refer to James only as “Il talento!” from now on. *We gave an interview about our blog to German fashion network Anangu, which you can read here (if you’re a member). *”I’ve become terrible at being the kind of stylist that stands on a shoot with a lint roller.” Katie Grand gets the recognition she deserves with the “Innovator of the Year” award and sits down for a portrait with WSJ. *Not entirely my style, but how cute are these Isabel Marant sneakers? *Much more my style: masculine dressing. Sandra from “A love is blind” captured a girl who gets the pleated pants and buttoned-up shirt look just right. *Surely this is a joke: Selfridges have launched a lip balm in co-operation with Vaseline with a crème brûlée flavour. How is a lip balm supposed to work when all you want to do is eat it? *Did you see? James designed an awesome clutch, which you can now order from him. Go have another look! This entry was posted in a week in fashion, fashion and tagged James Castle, thu thu. Bookmark the permalink. Post a comment or leave a trackback Trackback URL.